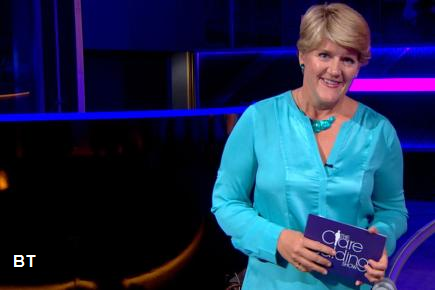 The BBC and BT have agreed a new content sharing deal, which will see The Clare Balding Show broadcast on both BBC Two and BT Sport from April. The new 12-show series starts on 2 April. An hour long version of the entertainment and sport chat show will be broadcast on BT Sport on Thursday evenings, with a half-hour show broadcast on BBC Two on Friday evening. Viewers will see Clare Balding interview the biggest and best of British and international sportsmen and women in a fun, open and relaxed setting. Past guests on the show have included Sir Alex Ferguson, Mike Tyson, Martina Navratilova, Mark Cavendish, Dame Kelly Holmes and Jose Mourinho. It will be filmed at the BT Sport studio in London in front of a live audience who get the chance to ask their heroes and heroines questions. "I'm delighted that The Clare Balding Show will now reach a brand new audience via the BBC following this unprecedented deal. This series provides a rare opportunity for sportsmen and women to reveal their true personalities, away from the pressure of competition." "Over the last two years we've hosted major sporting names in front of a live audience, we've broken stories, we've laughed and we've asked tough questions. I really hope people will appreciate the relaxed, fun nature of the programme and that it appeals to non-sports-fans as well as committed enthusiasts." The BBC and BT Sport have previously worked together on covering live sports events, such as the FA Cup, but this is the first time there's been such a deal over a non-live sport show. The BBC has been increasingly co-operating with other organisations to secure content following budget cuts. Last year, it announced a deal with Amazon that secured a third series of Ripper Street. In 2011, the BBC surrendered its right to screen live F1 exclusively until 2013, when it agreed to share coverage with Sky in an extended deal allowing the public service broadcaster to keep some coverage until the end of 2018.